It’s not a bad start to the day. This is what I’ve been waking up to every morning, along with the sound of barking owls, blue-winged kookaburras, and brown honeyeaters. It’s very noisy. The dawn chorus seems so much louder out here. I’ve also watched a wallaby scampering around whilst I’ve brushed my teeth. This is life in the Northern Territory. The nearest town is Batchelor, some 15km away. The nearest city is Darwin, which is about 130km away. 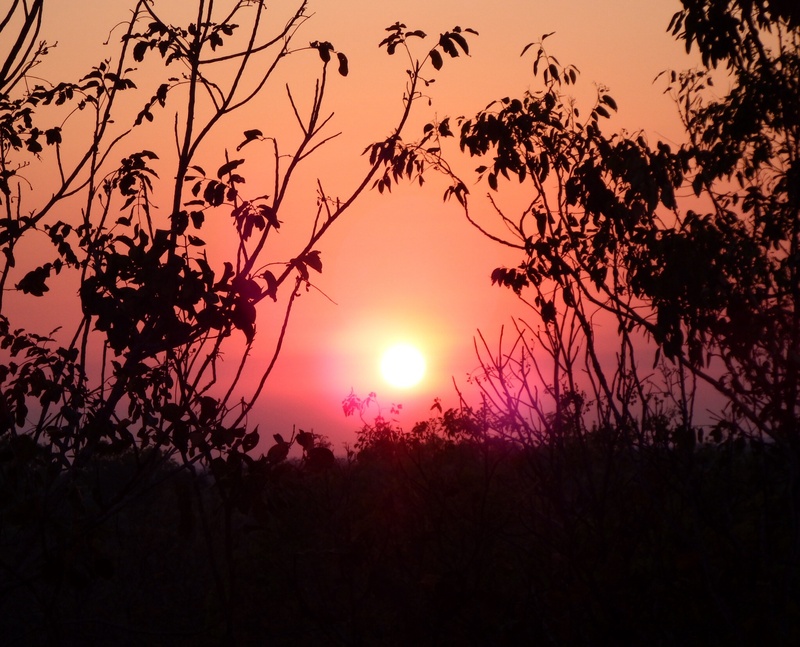 It’s the dry season and most days have been about 34c. It means that forest fires are common. I took this photo from the house. 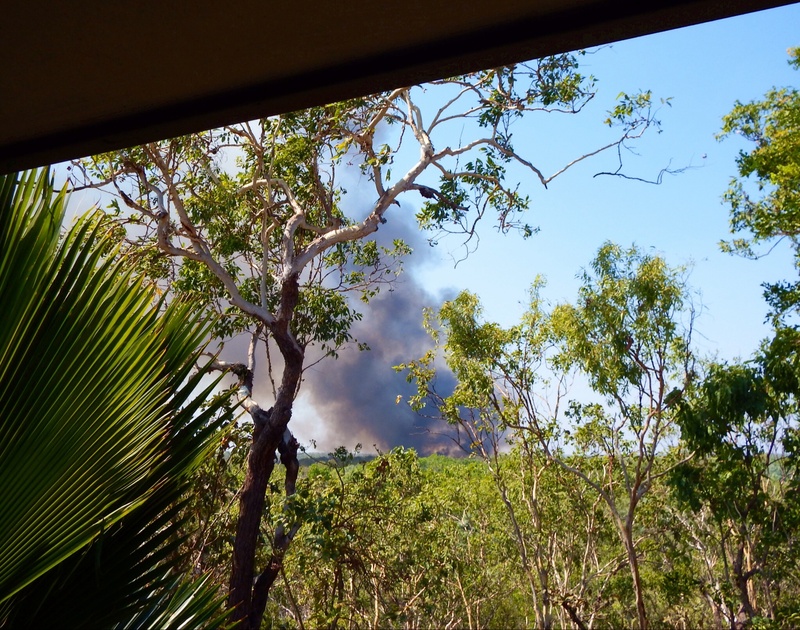 It was about 2km away and lasted well into the night. Even from that distance, the smell lingered for hours. The farmer here has a fire truck. He told me I only had to worry if I could hear the ‘crackling’ sound. Alright then. 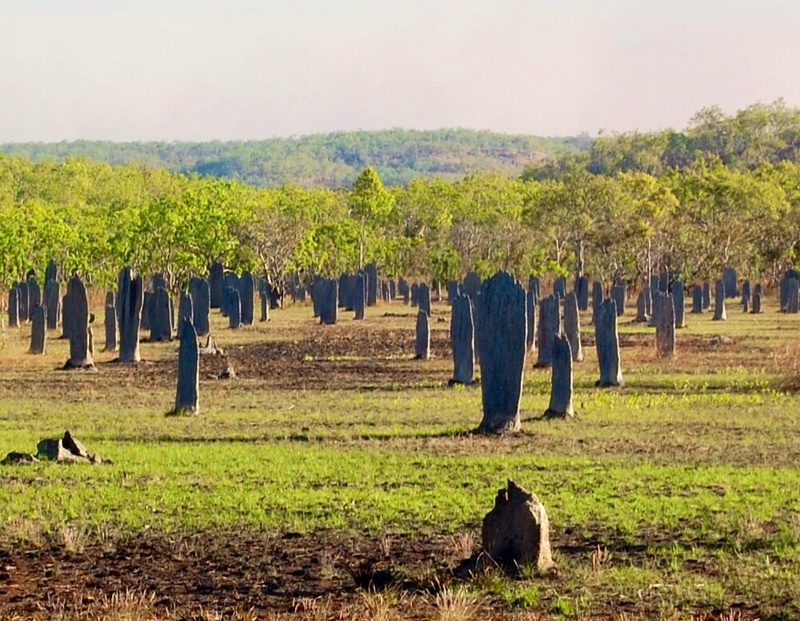 It looks like a graveyard, but these are magnetic termite mounds at Litchfield National Park. Some of them are about 3m high. They’re built with the broad areas facing east and west – the termites’ clever method of climate control. 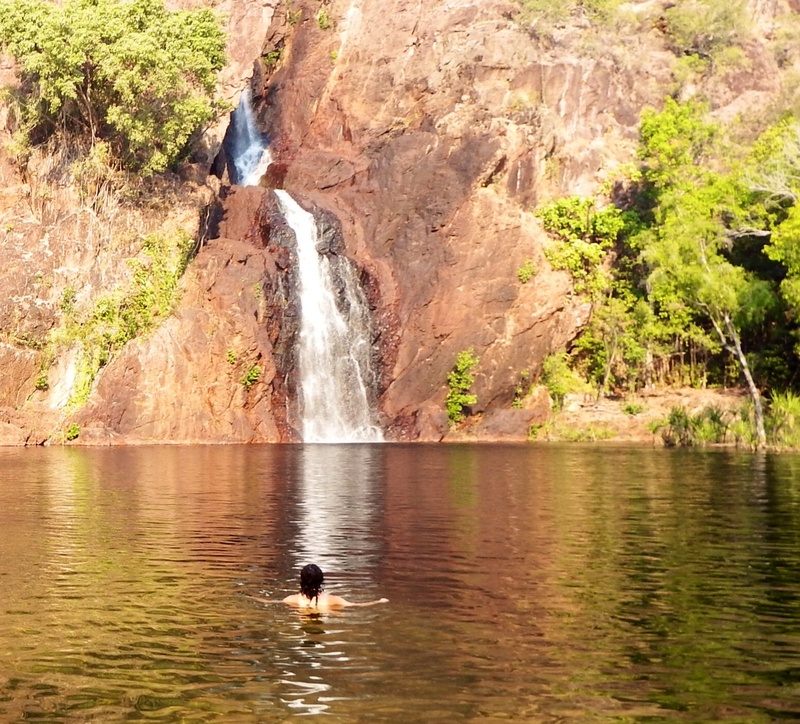 This has been my favourite spot for cooling off – Wangi Falls. I took a daft photo for a friend who warned me about the crocodiles here. I pretended one was in the water. Ten minutes later, there was a very wide wake near the rocks – wide enough to make the swimmers stop and come closer to the steps. I’m trying not to think about it. 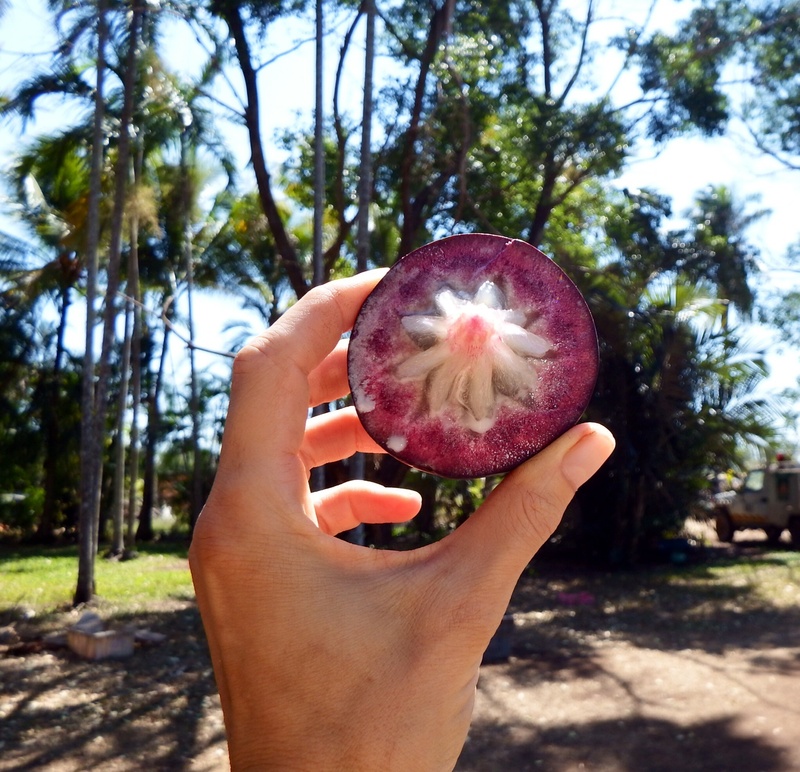 Here in the Territory, they have tropical fruits that I’d never even heard of. This is a star apple. It’s soft, quite creamy and sweet. The seed parts are a bit like lychees. I also love soursops. They’re prickly on the outside and their stringy white flesh on the inside looks a bit like chicken. They taste like a tropical fruit drink mixed with bubble gum. Delicious. 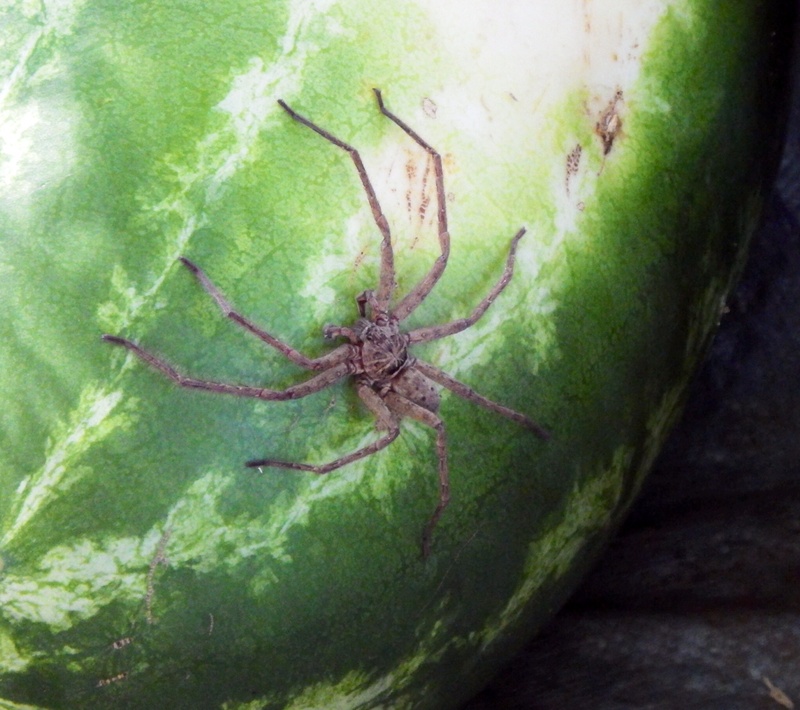 The only thing that can put me off a slice of watermelon is one of these. Huntsman spiders will give you a nasty bite. 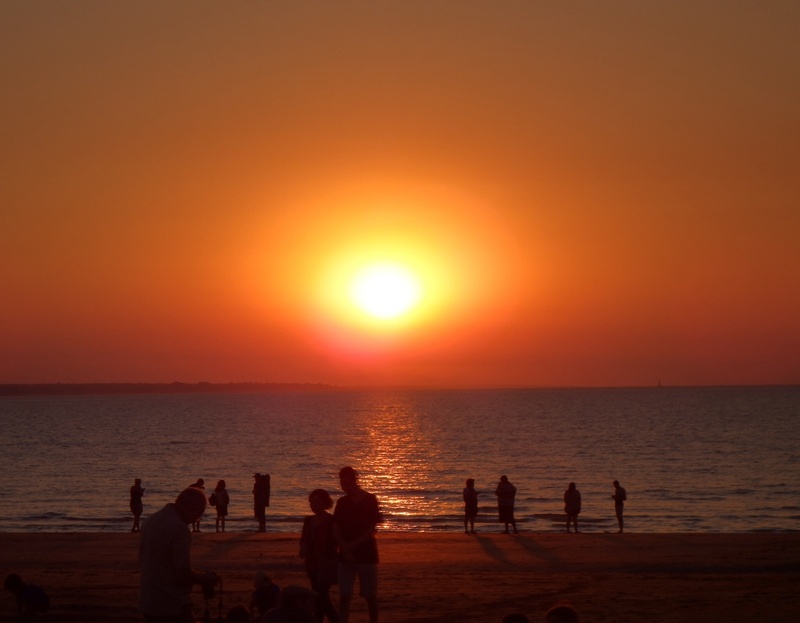 Hundreds of people sit on the sand to watch the sun go down and there’s often a round of applause! The Territory’s a world away from the cities down south. It’s been a memorable month. Next stop – Bali. It’s hard work, but somebody has to do it. 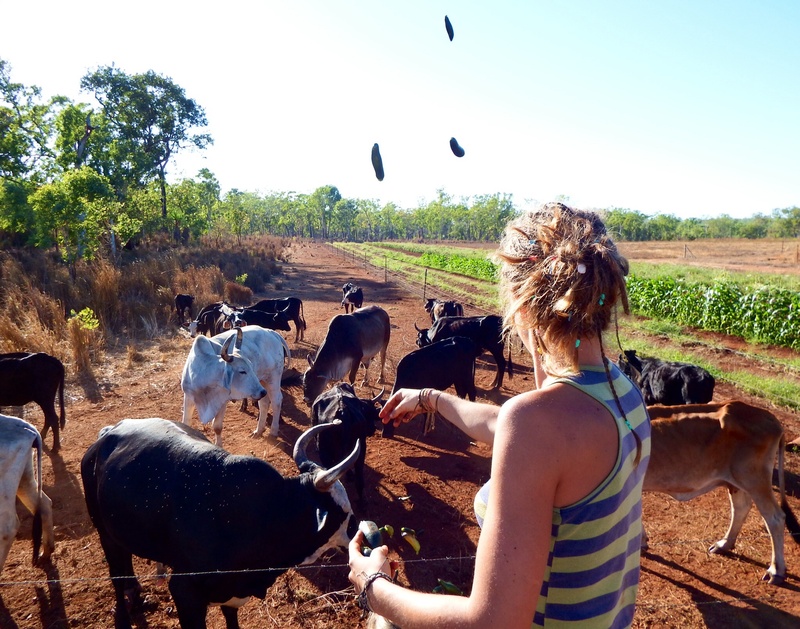 This is Thompson’s Farm at Batchelor in Australia’s Northern Territory. The last time I was WWOOFing, I was picking buds off vines. This time, I’ve been picking watermelons off vines. They’re slightly heavier. 12kg heavier in fact. The trick is to look for one that’s already caught the sun. There should be signs of a yellow patch on the skin. You then give it a tap. If it makes a noise like a ‘ping’ or a ‘bounce’, it’s good to go. If it’s dense, it’s overripe. If it’s hollow, you have to turn it around for a closer look because something else has obviously got there first. 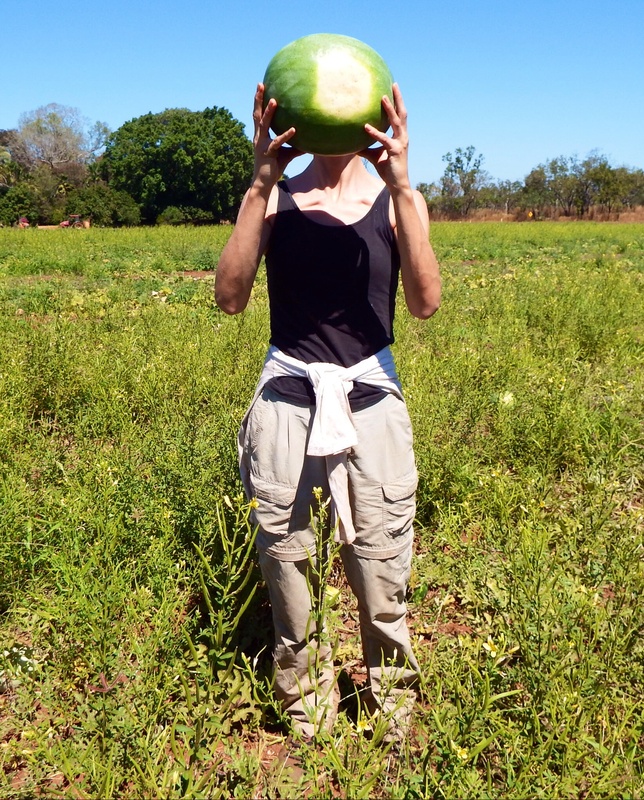 Watermelons are a delicious feast for white ants, cockatoos and wild pigs. I’ve had to chase off wallabies who love the shoots. You can understand why these ‘sugar babies’, (as they’re affectionally known) are so popular. 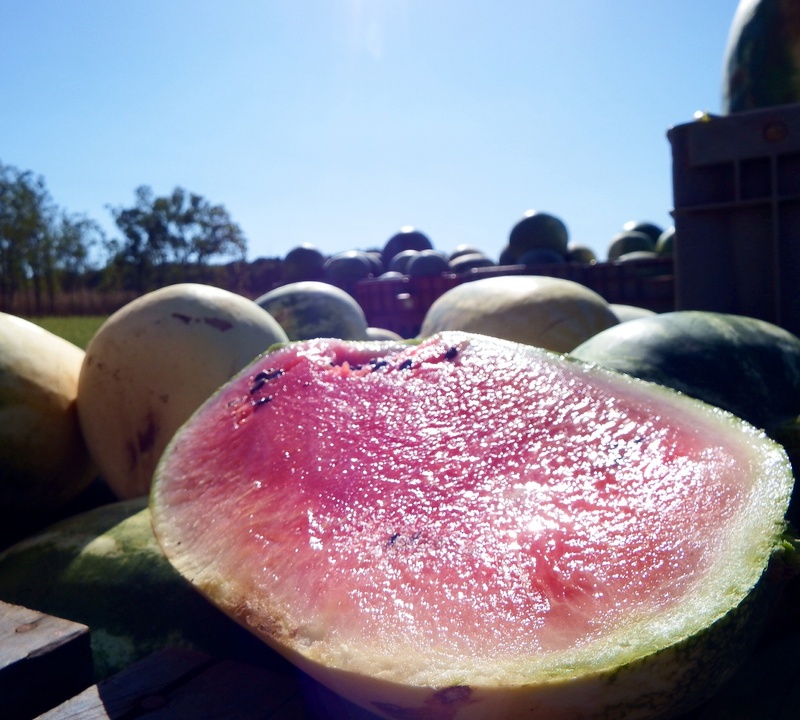 There’s nothing better than sitting on the back of a truck after a hard morning’s work and eating a slice of sweet, juicy melon warmed by the sun. We’ve called it ‘testing’ although that doesn’t really make sense, because the rest of it can’t be used. Do you see the cunning nature of our work? 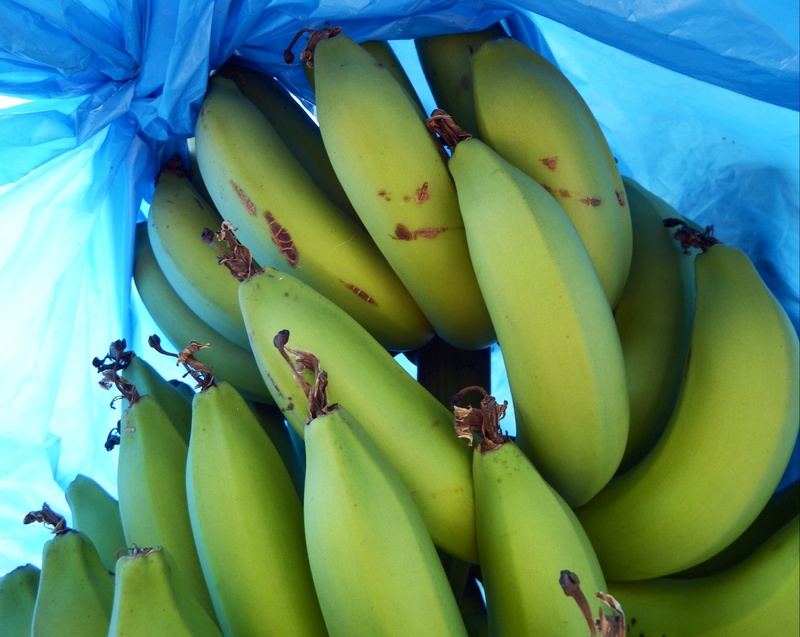 We’ve also been picking bananas. They’re covered in plastic to keep the moisture in and the moths, rats and spiders out. The first step is to feel for a full fruit. 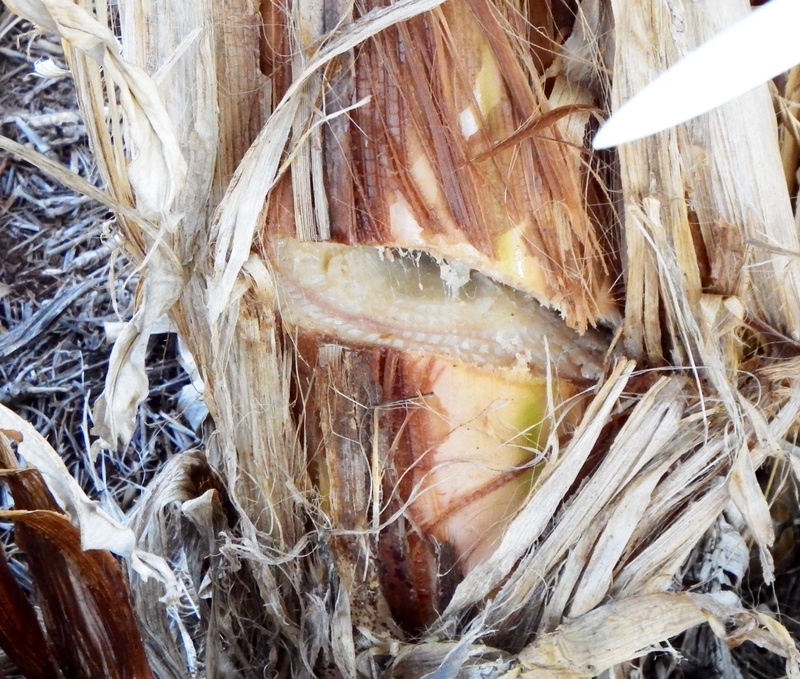 Then, if you open it up and it looks like some of the bananas are turning yellow, it’s time to cut off the bunch. 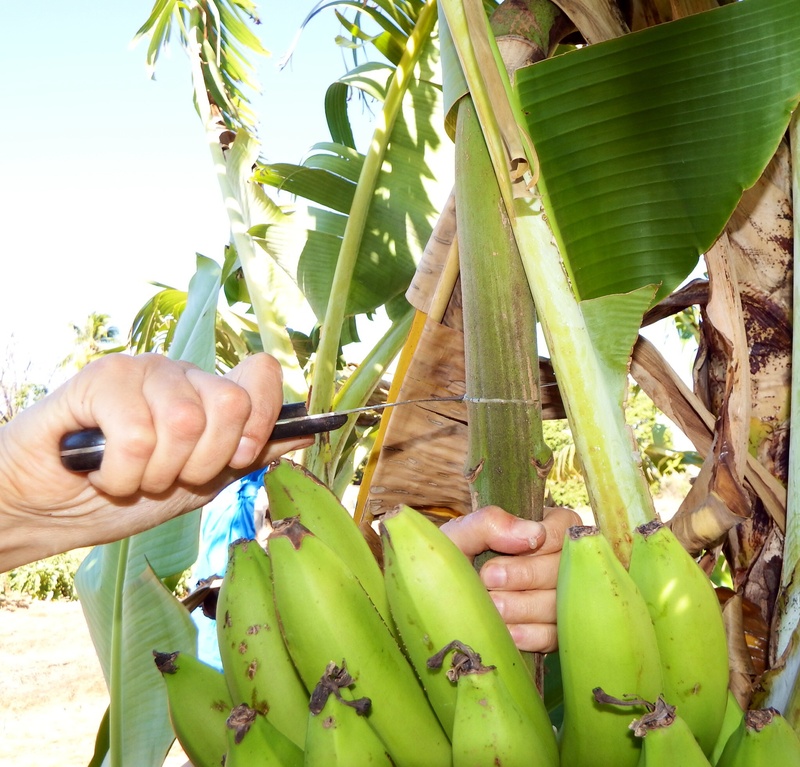 You leave a few inches on the stem so that there’s enough room to hang them and get the bananas fully ripe. Once the fruit is picked, it’s time to cut down the entire tree. This is because one tree can only produce one bunch. It’s surprisingly easy – the trunk is fibrous and mushy. You just have to get out of the way when it falls. 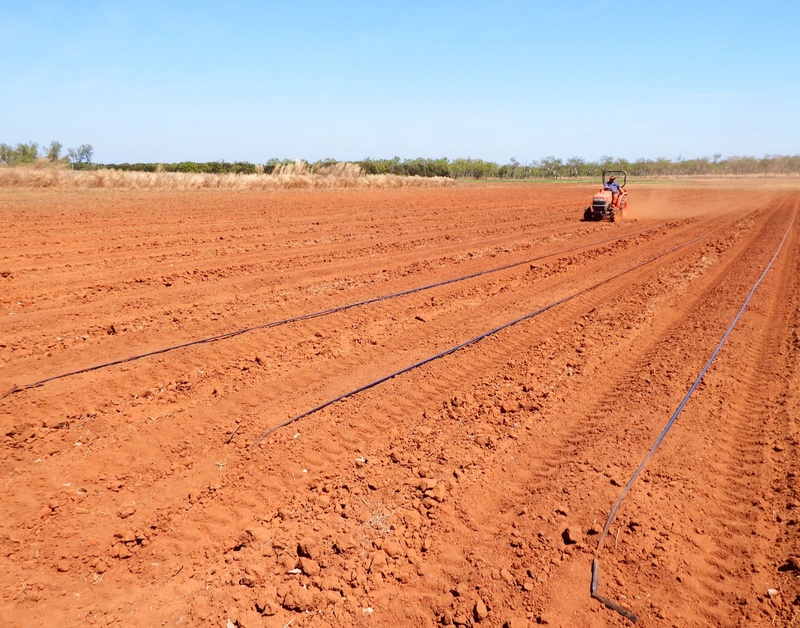 Laying down irrigation lines is dirty, dusty work on a hot and windy day – and it has been hot, with an average of 34c. I love the rich red colour of the soil but up until three years ago, some of this couldn’t be used. Years of chemicals had taken their toll. That’s why the Thompsons started using organic farming methods instead. They now use soil enhancers like gypsum, agralime and chicken manure. The main pesticide is neem oil. They also use potassium silicate, which feels like small shards of glass. The results are good. 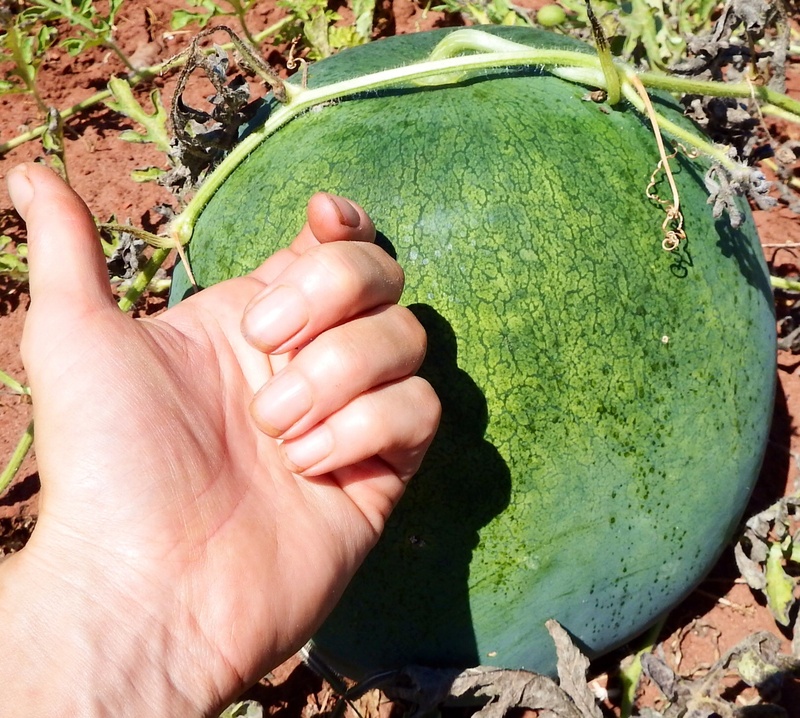 The watermelons can now grow up to 12 or 15 kilos. Five years ago, they only reached 8. The yield from courgettes has tripled. They’re a favourite with the cows here. Any bad fruit or vegetables that we’ve picked has gone straight to them. They’re the happiest beasts you’ll ever meet. 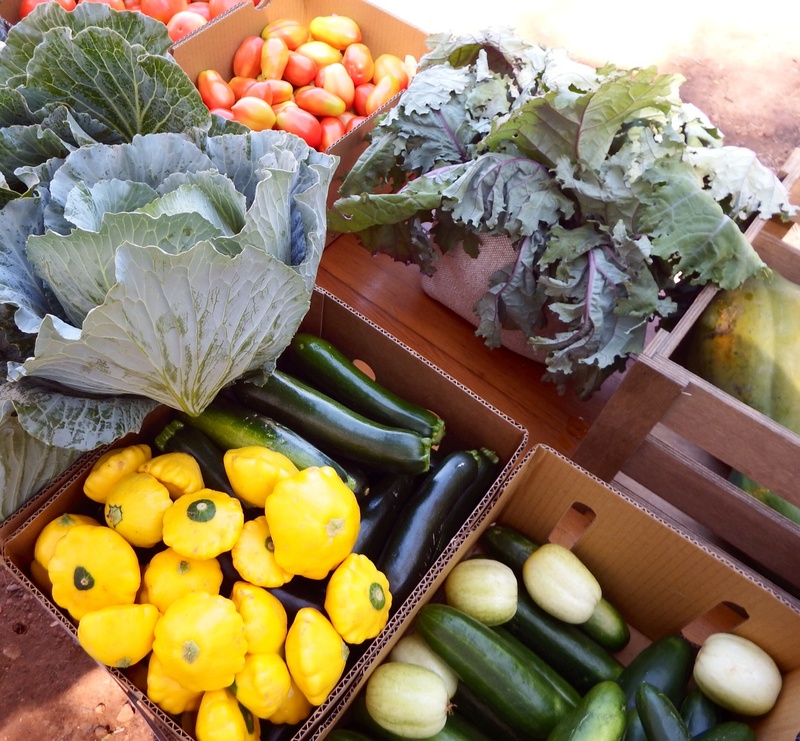 The farm shop has been another satisfying part of the volunteering – proudly displaying the produce you’ve carefully planted, picked or packed. Customers talk about how much better they taste than the fruit and vegetables they buy in the supermarket. The farm manager and his wife are expecting their first baby in November. He wants the soil to last long enough for his own children to grow vegetables here. That’s why the organic way works for them.